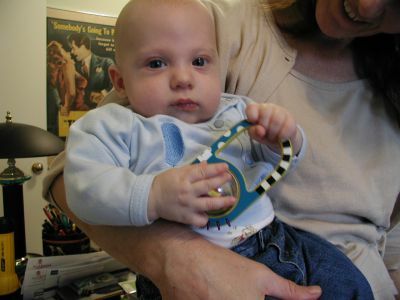 Ian has recently learned that his hands can be used for more than just sucking on. They can also grip things. His first favorite grippable object is a rattle his aunt Starin and uncle Jay gave him for Christmas. He takes his gripping responsibilities very seriously! We recently discovered that Ian is actually a cyborg! 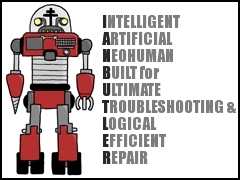 But we did have fun playing with his name and the names of family and friends on The Cyborg Name Generator. 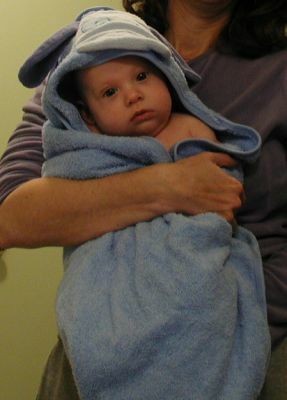 It’s not Ian’s first bath, but it is one of his cutest ones. And the one he giggled the most during. Ian’s second day in daycare went well. Jeremy and I had planned to spend our last day before classes start at the movies, but much to our surprise, the early matinee was cancelled! Instead, we had a GREAT relaxed lunch at the Globe. I felt like I really got to enjoy company and conversation with Jeremy. After lunch, I stopped by the daycare only to find Ian well fed and napping, so I left and returned at 3 PM as I’d originally planned (the movie was supposed to be out at 2:30). Ian was still sleeping! Hopefully, this means he is already getting used to his new surroundings. I hate leaving him, but it’s such a joy to come back to him. And it also feels good to be able to do my work AND spend special time with my husband. Well, Ian had a successful first day at day care. He tried out the bouncy chair, mobile, and baby gym. His biggest challenge for now is falling asleep and staying asleep in a new place. I’m sure once he gets used to the new sights, sounds and smells, he’ll sleep like a baby! As I type this, Ian is at day care! I’m sure they’re going to be best of friends. Today is Ian’s first day in day care! We’re sure he’s going to enjoy meeting the other babies and the teachers at the Children’s Discovery Center. Plus, we have no doubt he’ll be a star pupil there. Hi ian! This is your mama saying Welcome! You’re with me right now in my office. I’m trying to get some copying done in preparation for classes that start on Thursday, but you’ve been a bit of a fuss pot. I’ve got to set up a bed for you in my office. 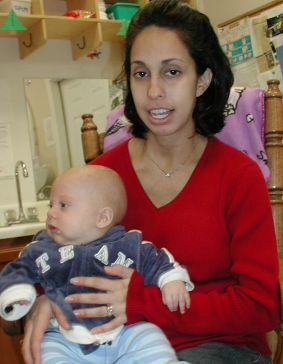 You don’t seem to want to sleep in your car seat,stroller, or sling even though you’re clearly tired. Maybe now that you have nursed, you’ll settle down in the sling! It’s not like we’re Iancentric or anything. We don’t believe that he’s the absolute center of the universe and, presumably, there are other babies that might be of interest to some. But, dag nab it, Ian is awful darn cute and we would like a journal of his everyday cuteness. And so Blog Ian was begun. We intend it for family and friends who would like to follow the the triumphs and tribulations of young Jeremy Ian Galbraith Butler as he makes his way through this world. And we trust this will seriously embarrass the teenaged Ian 13 years from now. There’s no telling how frequently Blog Ian will be updated. Check back when you can!